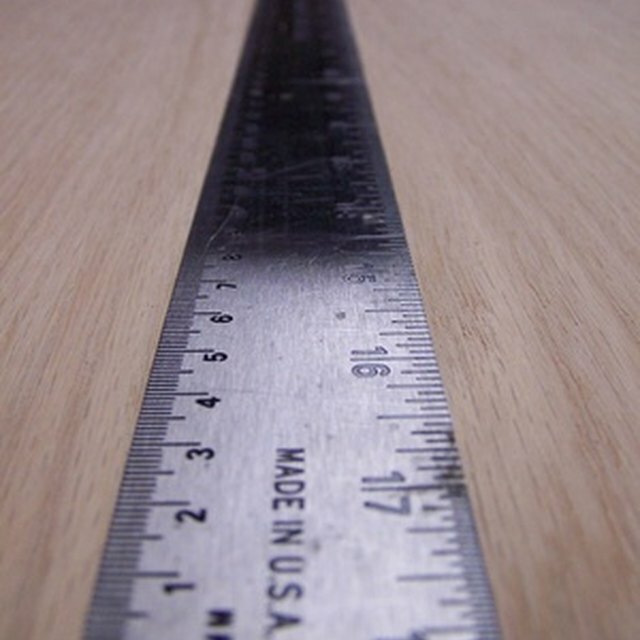 Measurements are commonly used in daily life. For example, you need to know what sizes of clothes to buy, how much space you have available for furniture and how far you have to travel to work. Societies require a standardization of units to ensure that measurements are precise and universal. Centimeters and meters – both metric units – measure length. Centimeters and meters are both metric units of measurement. The centimeter is 1/100 of a meter or, to put it another way, it takes 100 centimeters to equal one meter. A centimeter is 1/100th of a meter. It would take the length of 100 cm to equal the length of a single meter. A centimeter is equivalent to 0.39 inches. It is also equal to 0.033 feet, 0.011 yards and 0.0000062 miles. A meter is equal to 3.28 feet, 1.09 yards or 0.00062 miles. A centimeter is a much smaller unit of measurement than a meter. When measuring objects, it’s best to use a unit close to the size of the object. This way the measurement offers practical value. Imagine measuring the height of a person in miles or the length of a freeway in inches. These calculations would serve little purpose. More practical uses of measurement would be to measure a person or house in meters and to measure a worm or the blueprints for a house in centimeters. The term “centi” is derived from the Latin word “centum,” which means one-hundred. It was first used as “centi” by the French, who introduced the measurement when they created the metric system. When used as centi, it is defined as one-hundredth of a unit. Thus, a meter is 100 cm, or a centimeter is one-hundredth of a meter. Centimeters and meters are standards of measurement adopted by the metric system. The metric system uses base 10, incorporates seven units of measurement and is based on precise scientific calculations. This is different than the English system, commonly used in the United States, which uses base 12 and incorporates various units of measurement that are not scientifically based – such as the distance between the nose to thumb of King Henry I. Originally, the meter was defined by the French Academy of Sciences as “one ten-millionth of the length of the meridian through Paris from pole to the equator,” according to the National Institute of Standards and Technology. The calculation, however, was off by 0.02 mm, and it was redefined in 1889 and again in 1960. Finally, in 1983, the meter was defined in a way that is still used today, the distance light travels in a vacuum during 1/299,792,458 of a second. Thus, the meter, and consequently the centimeter, is based on an exact scientific calculation. Kang, Starr. "Difference Between Centimeters & Meters." Sciencing, https://sciencing.com/difference-between-centimeters-meters-8307792.html. 01 May 2018.